Those who know me well know that I no longer have a real excuse to be remiss in regaling you all with my food adventures. The last six weeks have seen many -- Maryland Blue Crabs slathered in Old Bay spice; four separate takes on Shrimp, Grits, and Andouille stew; and the bounty of my home state, Maine -- is it weird to eat a total of 6 different types of shellfish and crustacean on about 10 occasions during a 4-day trip home? This evening's post, however, is a bit more instructional. Perhaps you all were not yet bored with stories of my wild excitement at trying new foods and dishes, but I was becoming tired of sharing them. After all, I don't want to wear anyone out with my over-exuberant energy and passion for comestibles. As a change of pace, then, tonight's post is...USEFUL. [Cue gasps from the studio audience.] 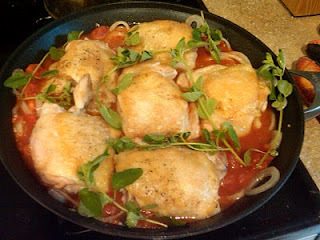 We will be making Tomato-Oregano Baked Chicken and Four-Bean Salad. There will be a recipe, instructions, photos, and of course, Hungry Sam commentary. On that note, it must be weird to cook in front of an audience. I digress. Before we begin, allow me to say this: Everyone can make this dish. I know most of my readers, and I know some of you have poor chef-images (does that pun work?). have the urge to throw your hands up and forget about it. But really -- although some dishes are legitimate challenges, and although improvising, balancing complex mixtures of spices, and certain techniques require practice, these and many similar dishes are within your reach. Where there's an appetite, there's a way. Closely follows a recipe from Everyday Food magazine. I love this publication -- if you're a beginner, it provides easy recipes and lots of helpful background and knowledge; if you're a health nut, all recipes have per serving health facts; and if you're experienced, it provides inspiration. -Something to prevent first degree burns when removing pans from the oven, like an oven mitt. If you're not sure what any of these items are, click the links or Google them. If you don't own these things and want to, I guarantee you can get them all on the cheap online or at Target. Just please, please don't skimp on the knife. One good knife is all I ask. I only own four and I do better than fine. TIP: If you shop intelligently, this should be an inexpensive meal and many of the ingredients are staples that will keep in your cupboard for ages. -4 T. grainy mustard. If you want feel tempted to use the cheap yellow stuff instead, don't. Also, throw that crap away. -Literally, an ounce of patience. Lots of people think they're lousy chefs because they stop paying attention and take a nap. This leads to failure and possible oven fires. Just pay attention. -A self-preservation instinct. As in, can you avoid cutting your fingers off? If not, stop reading. I don't want to be responsible for accidental amputation. Last tip: Wash dishes and put things away as you go. I am not a super punctilious person when it comes to neatness; it honestly just makes your life easier and your cooking more efficient. 1. Preheat your oven to 400 degrees Fahrenheit. TIP: Never put anything in the oven while it's preheating. The oven preheats by applying LOTS of heat fast; things will burn. 2. Turn on a burner and set it to medium heat. Place your frying pan on the burner and add about a T. of olive oil. 3. "Season" (add salt and pepper, a reasonably small amount) to both sides of your chicken. 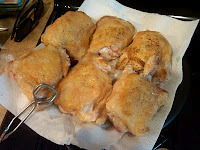 Place your chicken thighs skin-down in the pan and cook until the skin gets golden and a bit crispy-looking, about 7 minutes. TIP: Watch out for spatter. Hot oil spatters, burns, and hurts. Think about long sleeves, an apron, and perhaps wearing something you don't mind get covered in oil. 4. During this time, slice your onion nice and thinly, open your can of tomatoes, and get out your garlic. No reason not to use down time wisely. 5. Flip the thighs, and cook for about a minute. 6. 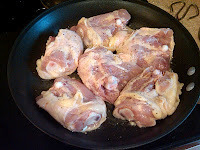 Remove the thighs from the pan and put on a plate. I put a paper towel underneath to absorb excess oil and fat. Pour out excess oil in pan, and BE CAREFUL. 7. Throw your onion into the pan and cook until it's soft -- it will become semi-translucent. Then, add your garlic and cook until fragrant. 8. Add the tomatoes and bring to boil. 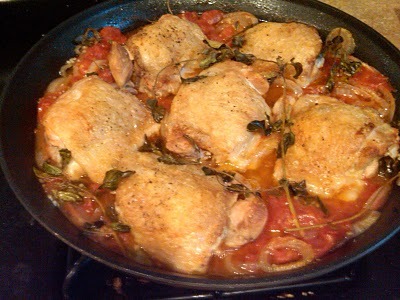 Assuming your frying pan is oven-safe, gently place the chicken back in the pan, skin side up, nestling the thighs into the sauce and distribute the washed fresh oregano springs around the chicken. If you need to transfer pans, go for it. Put the pan in the oven (which will definitely be preheated by now) and set a time for 25-30 minutes. TIP: Set a timer. Really. 9. Now the salad. Put the stock pot, 1/3-1/2 full of salted water, on a burner set to high and bring it to a boil. Trim the ends off the green beans and cut them in half. Open your canned beans and rinse them off in the colander, then transfer them to a bowl. 10. Once the water is boiling, toss in your beans and cook for 3 minutes. 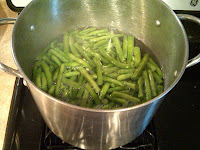 What you're doing is called "blanching" and it's a great way to make beans and a few other types of veggies a little sweeter and way crispier. After 3 minutes, drain in the colander and rinse them with cold water to bring the temp down. 11. Finely chop some fresh oregano (you'll have bought enough if you purchased a little package), about 3 or 4 sprigs worth of leaves ought to do. Finely slice your shallots. 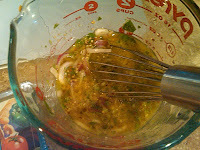 In a bowl or measuring glass (pyrex measuring glass is my go-to) mix together the vinegar, oil, mustard, oregano, shallots, and add a little salt and pepper. TIP: Taste it -- if it's bland, that means there's not enough salt. In this case try adding a scootch more vinegar and mustard. 12. Combine the dressing mixture, the canned beans, and the green beans; toss well. 13. Your chicken should be done. Remove it from the oven and let it cool. 14. Now send pictures to your loved ones to make them jealous of how awesome you clearly are. This step is vital. As you eat it, think about the flavors and ingredients. Does the meal taste like something else you've eaten before? How? What were the ingredients or spices which made the earlier experience different? What's your favorite part about this meal? What would improve it? By asking yourself these questions, you can teach yourself how to improvise by combining the successes of various meals and drawing on that knowledge later. 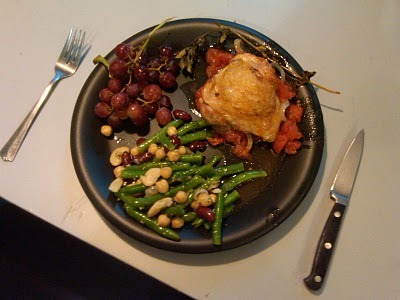 There you have it: An easy, inexpensive, and reasonably healthy meal. As to the last point, although I've improvised a little, Everyday Food notes that each thigh with some of the sauce comes to 217 calories, 7.9 g fat (1.4 g sat fat), 19.3 g protein, 20.7 g carbs, 2.4 g fiber. The bean salad is tougher to estimate, given how I've altered the recipe, but it's beans and such -- high in protein and fiber. The only fat in the salad is the olive oil, which is heart-healthy monounsaturated fats and low in sat fat. Ok, there's some sodium in there too.